Word on the street is that Wyclef Jean was shot as he exited a car to have a private phone call while traveling in Port-Au-Prince, Haiti. 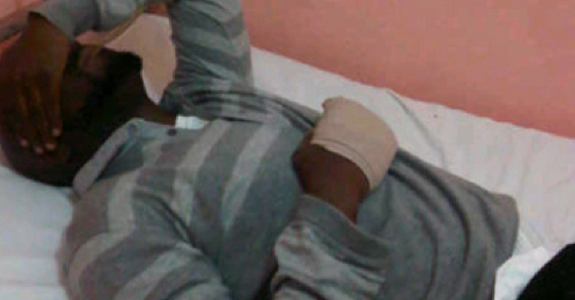 After being treated at an unidentified hositapal, Wyclef revealed that the bullet only gazed his hand. In relation to what happened, Wyclef told the AP “I heard blow, blow, blow and I just looked at my hand.” The singer noticed blood on his shirt and shoes before realizing what happened. The singer was int he country to cast his vote for fellow artist Michael Martelly who is running against first lady Mirlande Manigat. The culture of violence in Haiti has escalated due to the upcoming elections and the devastation of the earthquake. The singer went on to cast his vote, citing that nothing would stop change in Haiti. Old Clef must be shitting in his pants right now. The bullets only grazed his hand, but that is just the result of bad aim. Someone was trying to kill the “pride of Haiti”. Wyclef has refused to co-operate with the police and so the investigation is on hold. Now, where I come from, if you don’t want to talk to the po-po, that means you think they maybe involved. Might as well start lining up the usual suspects…I hope Lauen Hill and Pras have a solid alibi. Next Post Judge says “Hell to the Naw” to Scott Walker and his Collective Bargaining Initiative.